Robin Hood is something of a curse word in the fantaesque household. Many moons ago my boyfriend-now husband decided to write his thesis on the changing media interpretations of the English folk hero and so began his quest to watch every film and TV version of Robin Hood there has ever been. Which happened to include every single sodding episode of Robin of Sherwood. If you have never heard the introductory tune, here it is. Now imagine this, multiple times a day, every day for three months. Welcome to my nightmare. In fact the only way my mental state could survive was for me to study Robin Hood at the same time, despite having absolutely no interest in it. This post is adapted from a short paper I wrote during my Masters, wherein I look at the ways in which the Robin Hood stories have been adapted and reimagined on the big screen, and how films have used Robin Hood to reflect a political ideology. Robin Hood is an English folk hero who traditionally incurs the wrath of King John through his support of John’s brother; Richard the Lionheart. According to the myths he lived in Nottingham’s Sherwood Forest, with a band of outlaws, from where he schemed against King John’s henchman the Sheriff of Nottingham. The Sheriff was responsible for enacting John’s harsh taxations on an already impoverished people, so Robin and his men would steal from the rich beneficiaries and return the wealth to the people. Usually with Robin displaying his famed archery skills and winning the heart of the fair maid Marian. Historically however there is next to no evidence to suggest that Robin existed. The first stories of Robin Hood emerge in the fifteenth century even though he supposedly lived during the late twelfth century. Considering how prolific he apparently was you would think there would be even a scrap of historical evidence to support his existence, but there is none. Modern historians are still locked in debate as to whom he could potentially have been, but the list of prospects is still quite long. Most popularly he is referred to as the Earl of Huntingdon, though this earldom was specifically given to the ruling house of Scotland and the earldom was occupied by David of Scotland at the time of Robin’s ‘life’. The only possible piece of historical ‘evidence’ for Robin’s existence is a gravestone at Kirklees Abbey, the place of Robin’s death. The grave is apparently for a Robert, Earl of Huntingdon; archer and outlaw who sometimes went by the moniker of ‘Robin Hood’. Except there has never been a Robert, Earl of Huntingdon and the grave appeared after the ballads of Robin Hood referred to his death and burial at Kirklees. Medieval abbeys had a long tradition of tourism and would display saints relics to draw visitors to their halls, so it is not a stretch to imagine that the Cistercian monks at Kirklees fabricated the inscription as a bid to boost trade. What about Maid Marian? As a noblewoman and an apparent ward of the king surely there is historical precedent for her existence? Unfortunately not. In the earliest ballads Marian was actually a shepherdess with no gentry connections at all, it was not until an Elizabethan play in the late sixteenth century that recast Robin’s love interest as a Norman lady of noble birth. Until then she had been an allegory for the Virgin Mary to contrast with Robin’s rampant disdain for churchmen. Although the basic narrative of Robin Hood films stay the same, i.e. skilled archer outlaw lives in forest with band of righteous miscreants, taking wealth from evil king and corrupt henchmen and giving it to impoverished but loyal peasants, Robin has remained a staple choice as hero for the film industry. There have been seventy separate films or television series featuring the character, and this does not include spin offs where lesser Robin Hood characters act as the protagonist (most notably Maid Marian). 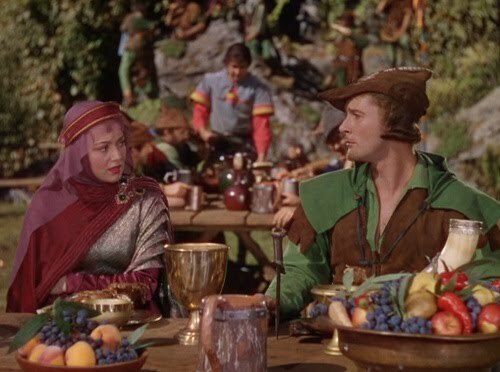 Many television series have a Robin Hood episode, starting as early as 1949 where a Bugs Bunny cartoon featured footage of Errol Flynn’s performance as the outlaw. This article: Basically an excuse to use *this* gif. 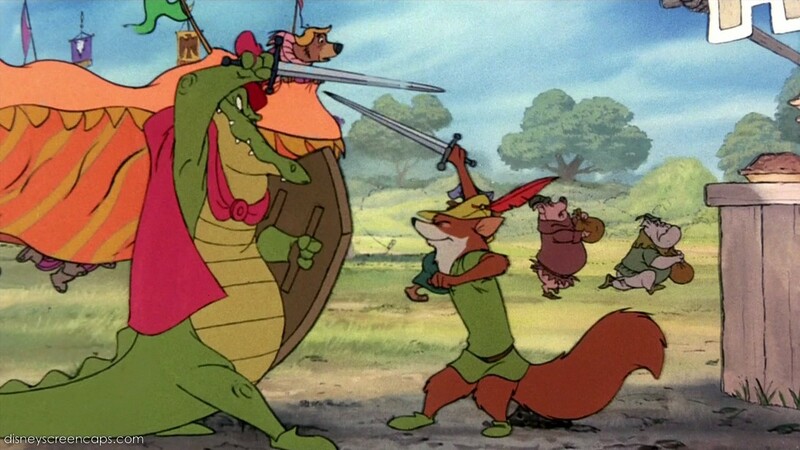 In terms of content, Robin Hood films are a guaranteed visual spectacle featuring sword fights, archery contests not to mention the pageantry and grandeur of the twelfth century setting. There have now been so many filmic reworkings that there are staple elements of the Robin Hood legend that have no origin in the original legends and instead have been introduced by film companies. This shows that the legend is continuously evolving and is being added to five centuries after the first ballads of Robin Hood were performed. Starring: Errol Flynn and Olivia de Havilland. Would you believe these colours, all of these colours are deliberate? Arguably the most popular of all Robin Hood films, despite its age. Errol Flynn epitomises the adventurous aspect of Robin, as he fights the oppressive King John. John and his noblemen are referred to continuously as ‘Normans’ drawing distinctions between the ruling Norman class and the oppressed ‘Saxon’ peasantry. Robin Hood is a Saxon noble, albeit a minor one, who gives up his wealth and station to defend the Saxon commoners from King John’s injustices and restore Richard to the throne. The focus of the film is justice for all, a fair distribution of wealth and the overthrow of an oppressive regime, themes which were prevalent on the world’s political stage during the 30s. The bright scenery and costumes of the film and the energetic, charismatic hero provide the perfect escapism from the aftermath of the Great Depression, while the rise of Nazi fascism in Germany is reflected in the dictatorial regime imposed by King John. The message of the film is clear; problems are solved through the redistribution of wealth, at a time when Franklin D. Roosevelt was rebuilding the American economy through a series of initiatives which gave greater relief to those most affected by the Wall Street Crash. The tyrannical Normans are overthrown by a small yet passionate resistance group who ultimately proclaim their opposition to fascism. Starring: Sean Connery and Audrey Hepburn. Would you believe the lack of colours used was deliberate? For a rather different look at the Robin Hood character we have Robin and Marian which is anything but adventurous, swash buckling and warm hearted. In a darker look at the myth, an ageing Robin is a captain under King Richard, who long after the crusades have finished, is waging war in France. This Richard is not the valiant saviour of England, but practically a war criminal murdering women and children where he finds them. Of his king Robin says; “Richard spared the rich for ransoms, took the strong for slaves, then he took the children, all the children and had them chopped apart. Then he had their mothers killed. When they were all dead, three thousand bodies on the plain, he had them all opened up so their guts could be explored for gold and precious stones.” But perhaps more startling is that Robin Hood is happy to serve him in these crimes, he admits that he has committed atrocities in Richard’s name but has done so because Richard was his king and had commanded him to do so. A far cry from the traditional Robin who fights injustice in all its forms. Meanwhile he makes it clear that the Robin Hood of folk lore who apparently executed great and heroic deeds for the benefit of the people is an exaggerated legend who did no such things. Robin and Marian are still in love but it is a love tempered by the passage of time and their separation. Marian is now the abbess of Kirklees abbey, while Robin is recently returned from France and reunited with his band of men. Not here are there overblown declarations of love and grandiose gestures, instead the two annoy each other and bicker but demonstrate a sincere affection for the other, culminating in their deaths in each others arms. Starring: Kevin Costner, Morgan Freeman and Alan Rickman. Otherwise known as that God awful film with that God awful song. Yeah. You know the one. 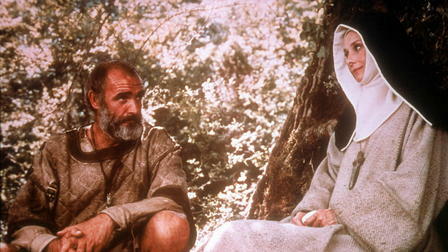 Released in the aftermath of the Gulf War, the focus of this film is the interracial friendship between Robin and the Moor; Azeem. The character of the Moor was introduced into the tradition by Robin of Sherwood (1986) in the form of the Saracen Nasir and has since become a regular addition to Robin’s band. The film shows how Azeem’s friendship is not only beneficial to Robin, through the sharing of the Moor’s technology, but essential as Azeem later saves Robin’s life. This is contrasted with the insinuated racial tones of the Sheriff’s oppression, with his templar knights donning suspicious looking white robes. Political and racial undertones aside, the film largely adheres to the myths of Robin with the protagonist saving the day, overthrowing the Sheriff and marrying Maid Marian. 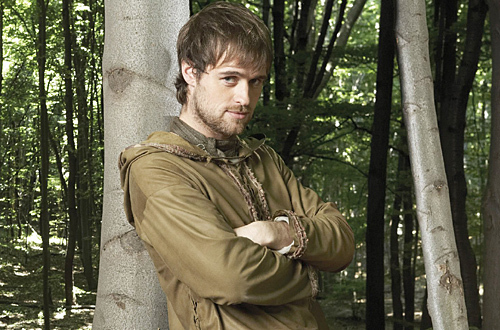 BBC’s recent series provided a rather anachronistic take on the Robin Hood legends most notably by having the actors wear obviously modern clothing with obviously modern hairstyles. It is an example of how the tradition is being continually reworked to account for a modern audience. While the plot remains fairly standard and familiar throughout the three seasons the series is notable for its treatment of female characters. Previously the only recurring female character was Maid Marian, however in keeping with the modern desire for strong, female characters Robin Hood introduces additional women, as well as expanding Marian’s role. The Moor established in Robin of Sherwood is replaced by a Saracen (Djaq), in this instance played by a woman. She brings the fighting style of her people as well as their medical knowledge (going so far as to revive Marian from a cardiac arrest), to the band when she joins Robin in exile in the forest. Marian herself is now ‘Lady’ Marian but also doubles as the ‘Night Watchman’ a ninja-esque character who engages in frequent stealth based combat. Although remaining Robin’s love interest, she foregoes the traditional role of needing to be rescued and saves herself from her own forced wedding by punching her groom in the face and storming off. After Marian’s death and Djaq’s departure the series introduces two new female characters. Kate of Loxley, an outlaw who joins Robin’s band but was poorly received by fans, and Isabella Thornton, a far more resilient character whose arrogance, paranoia but also self reliance is blamed on her successive betrayals by the men in her life. Isabella has a brief fling with Robin before she is appointed the new Sheriff of Nottingham where she proves to be as bad as her predecessor. Starring: Russell Crowe, Cate Blanchett and Mark Strong. Oh dear. Oh dear, oh dear, oh dear. Where to begin? Supposedly this film shows us the gritty, realistic, ‘historical’ Robin Hood at the expense of the charismatic, adventurous protagonist of lore, thus sapping any joy from the tradition. 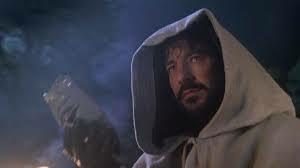 Robin is actually ‘Robin Longstride’ a gifted archer serving with Sir Robert Loxley in the Third Crusade. When King Richard is killed it falls to Robert to return his crown to England, and when Robert is killed it falls to Robin who disguises himself as Robert and assumes his identity. Robin is accepted by Robert’s father and wife (Lady Marian) while becoming embroiled in a plan to thwart King John’s agent Sir Godfrey, who under the guise of collecting taxes is actually laying the foundations for a Civil War, which in turn will allow the French King to invade. And that’s just act one. Robin then convinces King John to sign a charter (apparently the Magna Carta) which will guarantee the rights of every man in England. Apparently the draft for this treaty was drawn up by Robin’s father (an iron worker) to protect the common man from the powers of the aristocracy. The charter, however, practically mimics ‘We the people…’ rather than the Magna Carta it supposedly is. After satisfied he has successfully won the fight for labourers’ rights, Robin goes to ward off the French invasion in a sequence reminiscent of Saving Private Ryan more than a medieval battle. Oh and Lady Marian shows up, in full armour, leading a cavalry charge of children…on ponies. Needless to say the most illegal thing Robin engages in during this film is planting a field with stolen grain. The Magna Carta was not comparable to the American Constitution, did not outline the rights of the peasantry under their gentry masters and certainly was not drafted by a iron worker, who would probably have been illiterate and would have definitely lacked the political power required to get the king to sign such an act. France did not invade at Dover in a D-Day style landing and a woman would not have led a cavalry charge of children…on ponies. With the exception of a highly fictionalised King Phillip and King John nobody in this film existed, so the supposedly ‘historical’ Robin is explored through the medium of an entirely fictional cast and an entirely fictional plot. Go figure.